BACKSTREET BOYS ANNOUNCE HEADLINING RESIDENCY AT THE AXIS: Backstreet Boys (BSB), the best-selling boy band of all time with more than 130 million albums sold worldwide, will begin a residency inside The AXIS at Planet Hollywood starting Wednesday, March 1, 2017. General tickets for their 9 p.m. shows and first 18 dates through July 1 begin at $39 and are on sale now. The “boys” now men include Nick Carter, Howie Dorough, Brian Littrell, AJ McLean and Kevin Richardson. The production called “Backstreet Boys: Larger Than Life” will celebrate their more than 20 years of chart-topping hit songs. In 2013, BSB celebrated their 20th Anniversary with the release of the album “In A World Like This,” which saw the group receive a star on the legendary Hollywood Walk of Fame, perform for the President of the United States, and appear in the Seth Rogen film “This Is The End.” BSB is currently in the studio working on their next album. 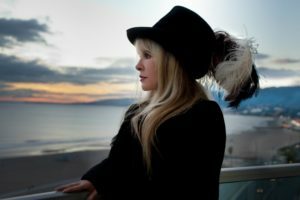 STEVIE NICKS WILL BE FIRST PARK THEATER AT MONTE CARLO HEADLINER: Rock ‘n’ Roll legend and singer-songwriter Stevie Nicks will be the first artist to perform at the new 5,300-seat Park Theater at Monte Carlo when it opens Saturday, Dec. 17. Nicks will be joined by special guests The Pretenders at 8 p.m. Tickets start at $95. The new Park Theater will highlight a classic contemporary design and be one of the most technologically advanced venues in the world. The farthest seat from the stage will be 145 feet. EVEL PIE WILL OPEN ON EAST FREMONT STREET DOWNTOWN: High Horse, a new hospitality collective based in Las Vegas, continues to build on the success of its first concept, The Golden Tiki, with a new restaurant called Evel Pie opening this month in the East Fremont Entertainment District downtown. Evel Pie, operated in cooperation with Knievel’s son Kelly, will pay tribute to legendary motorcycle daredevil Evel Knievel while serving New York-style pizza in a 1979 pizza shop atmosphere with a few modern touches and the namesake’s memorabilia. WEEKEND CARS AND COFFEE EVENT RELOCATES TO SPEEDVEGAS: Every Saturday morning beginning Oct. 8 hundreds of car enthusiasts will convene at SPEEDVEGAS for the weekend pop-up attraction, Cars and Coffee. The event attracts 600 to 1,000 car aficionados with more than 250 cars typically on display. Admission is free and the event will run from 7-10 a.m. with the track opening to the public at 10 a.m. Breakfast and coffee will be available for purchase. The debut of Cars and Coffee at SPEEDVEGAS comes following a nearly 10-year span at its previous location near St. Rose Parkway and Eastern Avenue. To celebrate its debut at SPEEDVEGAS, the first 10 attendees and first 10 cars owners who arrive will receive a complimentary SPEEDVEGAS experience, which will include the option to drive or ride for three laps in any car of their choice. After that, attendees will receive $20 ride along laps in any one of the available SPEEDVEGAS muscle and drift cars. LUXURY APARTMENT COMMUNITY BEING BUILT IN CHINATOWN: Fore Property Company (FORE), which has developed 23,000 apartments nationwide, and partner, Argosy Real Estate Partners, broke ground for a new, 295-unit luxury apartment community at the gateway of Chinatown, just minutes away from the Strip. The LEED Silver designed community is the first infill project of its kind in the area. Amenities will include a rooftop terrace, a yoga/spin room, two resort-style pools complete with a DJ booth and cabanas, virtual sports room, 24-hour fitness center, massage room, concierge services and 9,000 square feet of retail space. R&B LEGENDS PARTICIPATE IN ‘OLD SCHOOL PARTY JAM’ AT ORLEANS: Old School 105.7 will present the return of “Old School Party Jam,” a concert event featuring a collection of R&B legends including S.O.S. 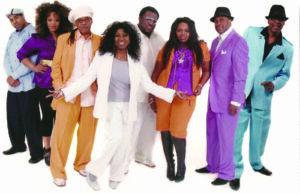 Band, Lisa Lisa, Zapp, One Way, Candyman, all-female group Klymaxx, C+C Music Factory featuring Freedom Williams, Slave’s Steve Arrington, and Evelyn “Champagne” King, and more at the Orleans Arena on Saturday, Oct. 22 at 7:30 p.m. Tickets are available from $35. ‘DECADENCE IN THE DESERT’ STARTS UP AT REMODELED ETHEL M: Ethel M Chocolates Factory Store and Cactus Garden in Henderson will start up its all-new Decadence in the Desert culinary and art event on Saturday, Oct. 15 from 2-9 p.m.in its newly remodeled space. The free event will be held every second Saturday starting in November and feature dozens of local artists, food trucks, entertainment, and complimentary candy samplings of Ethel M Chocolates. For guests interested in experiencing the tasting room, tickets are $19.99 at the retail store. SUMMERLIN® FESTIVAL OF ARTS RETURNS TO DOWNTOWN SUMMERLIN®: The Summerlin® Festival of Arts, celebrating its 21st year, will return to Downtown Summerlin® for a second year on Oct. 8 and 9 from 10 a.m.-5 p.m. with more than 100 fine artists and craftspeople from throughout the country, showcasing and selling their original creations. There will be a full schedule of entertainment and children’s art activities hosted by DISCOVERY Children’s Museum. The event and parking are free. 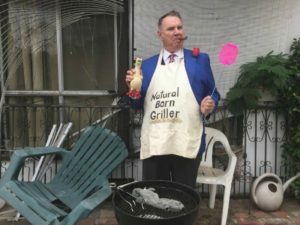 JEFF WAYNE AND FRANK LASPINA TEAM UP FOR BENEFIT SHOW: Comedian Jeff Wayne has joined forces with entertainer Frank LaSpina to raise funds for the Musical Arts Scholarship Program, which LaSpina founded in 2006. This “double-header” theater event will feature two full shows in the Cabaret Jazz room at The Smith Center on Sunday, Oct. 9 at 2 p.m. Wayne will do a special version of his famous one-man show, “Big Daddy’s Barbeque,” as directed by Ted Lange from TV’s “The Love Boat” fame, and LaSpina will present his multi-media-musical biography of Johnny Cash. Tickets are $25, call 702-749-2000. ♦On Saturday, Oct. 15, ONE DROP will join forces with Barrick Gold Corporation to host the fifth annual ONE DROP Walk for Water. The annual walk will kick off at 8 a.m. in Symphony Park at The Smith Center and end at the Las Vegas Springs Preserve, where participants will enjoy complimentary food and refreshments, live entertainment, raffle prizes and more at a Harvest Festival presented by the venue starting at 10:30 a.m.
♦The first of three Farm to Table style vegan dinners at Tivoli Village as part of the Sunday Supper Series with Chef Mayra will take place Oct. 16 from 4-7 p.m. with entertainment, music, wine, dance and a community charity as beneficiary. Tickets are $70. ♦On Tuesday, Oct. 18, BodySpa & Salon at Pawn Plaza will host “50 Shades of Pink,” a breast cancer fundraiser for the local chapter of Making Strides. The event features a cut-a-thon by BodySpa & Salon from noon–5 p.m. and a fashion show at 6 p.m.
♦HELP of Southern Nevada will host its annual Tea, Trends and Tranquility event at the Mandarin Oriental with a fashion show by Macy’s on Thursday, Oct. 6 from 2 to 4:30 p.m. Tickets are $125. ♦The Danny Gans Memorial Champions Run for Life hosted by Flamingo headliner Donny Osmond will be held Saturday, Oct. 15 at Town Square to benefit the Nevada Childhood Cancer Foundation (NCCF). Runners, walkers and community supporters are invited Rock-A-Tutu for kids with cancer and compete in the 5K run, the fun run/walk and team race. Registration is $30 for adults, $22 for children ages 12 and under and $40 day of the event. ♦Las Vegas’ only PGA Tour event, Shriners Hospitals for Children Open from Oct. 31-Nov. 6 at TPC Summerlin, will hold the tournament’s sixth annual Women’s Day Kick Off Your Heels Luncheon on Tuesday, Nov. 1. Tickets are $125, call 702-873-1010. ♦Aliante will partner with United Blood Services to host a community blood drive in the Scottsdale Ballroom from 9 a.m. to 5 p.m. on Friday, Oct. 14; call 702-233-9620. All donors will receive a coupon for a complimentary meal at Aliante’s Medley Buffet, along with a 2-for-1 voucher for a select number of shows throughout Las Vegas. ♦Tivoli Village will host the Cork & Soul fundraiser to support the nonprofit type 1 research JDRF organization on Saturday, Oct. 15 from 5-9 p.m. in the Piazza. Tickets are $50. ♦Create A Change Now, a local charity teaching at-risk students healthy eating to prevent childhood obesity, will host its second Edible Education Dinner at Panevino Ristorante on Saturday, Oct. 8 from 6:30 to 9 p.m. Tickets for the four-course dinner event start at $150. ♦Henry’s Place Foundation, a nonprofit organization formed in 2006 to honor Las Vegas Metro Sergeant Henry Prendes who gave his life in the line of duty protecting a victim of domestic violence, will host the 10th Annual Henry Prendes Charity Golf Classic at 10 a.m. on Sunday, Oct. 23 at the Spanish Trail Country Club. The nonprofit now has a 14-acre camp and retreat facility in Cedar City, Utah. Registration is $200 and $700 for a foursome; call 702-296-5078. The Venetian, The Palazzo and Sands® Expo will change the colors of their building signs in honor of upcoming awareness days, pink for Breast Cancer Awareness Month Oct. 1-8 and purple honoring Domestic Violence Awareness Month Oct. 9-16. BRIO Tuscan Grille (BRIO) at Tivoli Village will put its ‘breast’ foot forward this October for Susan G. Komen of Southern Nevada. On Wednesday, Oct. 19, BRIO will donate $1 from every pink cocktail purchased from 4–8 p.m. as well as 20 percent of all dine-in proceeds to breast cancer awareness. There will be seven pink drink choices. Silver Sevens near the Strip is joining the fight during National Breast Cancer Awareness Month by offering food and drink specials with a $1 from each sale benefiting the American Cancer Society through October. The Sterling Spoon Café is presenting pink-themed dishes like pink pancakes and the hotel bar is serving $4 pink drink specials. HEXX Chocolate + Confexxions inside Paris will show off its sweet side during National Breast Cancer Month by raising money for the Susan G. Komen Foundation on National Dessert Day, Friday, Oct. 14. 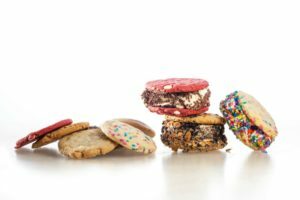 The café will be offering hand-crafted, build-your-own ice cream sandwiches with housemade cookies, priced at $6.95 and other desserts. Buddy V’s Ristorante inside Grand Canal Shoppes at Venetian|Palazzo will celebrate its third anniversary with a $40 three-course, prix fixe dinner on Monday, Oct. 10 beginning at 6 p.m. The Cake Boss, Buddy Valastro will greet guests. For reservations, call 702-607-2355. Pancho’s Mexican Restaurant in Downtown Summerlin, will celebrate its one-year anniversary with an all-day fiesta filled with live entertainment, food specials and more on Thursday, Oct. 6. 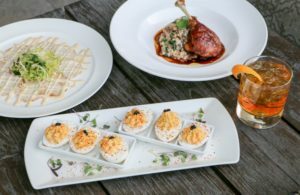 The Barrymore at Royal Resort is celebrating its five-year anniversary with a commemorative throwback menu running five weeks through Sunday, Nov. 6. The nostalgic favorites being revived include: Lobster deviled eggs $12; Vitello tonnato $15; Duck confit $29; and Diver scallops $33. 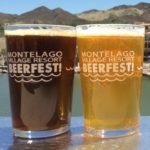 The MonteLago Village Beerfest returns for the second time this year to kick off the three-week Fall Festival at Lake Las Vegas on Saturday, Oct. 15 from 2-7 p.m. Hosted by the Auld Dubliner Irish Pub, the festival will feature 30 breweries with more than 100 craft beers, including seasonal selections. Advance tickets are $35 and VIP $45. A portion of the proceeds will benefit the nonprofit KUNV 91.5 FM. A special four-course wine pairing dinner created by Chef Daniel Boulud and Executive Chef Vincent Pouessel at db Brasserie inside The Venetian along with Brand Ambassadors from The Boisset Collection, Nico and Bibiana Snyman, will be held Friday, Oct. 14 at 6:30 p.m. Tickets are $85, call 702-430-1235. NOVE Italiano at the Palms is reinventing happy hour by offering nine, $9 appetizers served exclusively in the posh bar area from 5 until closing at 10 or 11 p.m.
Hard Rock Cafe is going green with its new, limited-time vegetarian menu for Vegetarian Month. From Oct. 3 through Nov. 13, both Hard Rock Cafes in Las Vegas are expanding their menu with fresh and creative vegetarian-friendly dishes and plant-based beverages, including Cauliflower “Wings,” a Grilled Ratatouille Wrap and a Very Veggie ‘Tini. OTTO Enoteca e Pizzeria at The Venetian is launching kid-friendly menu items for ages 12 and under showcasing the restaurant’s classic dishes in smaller portions. Aliante will host a $95 six-course wine pairing dinner, “Passport to the World,” at 6 p.m. on Tuesday, Oct. 11 at MRKT Sea & Land. Joe Phillips, master sommelier, will be the guest speaker. 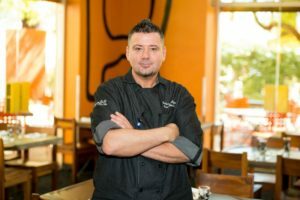 Border Grill Mandalay Bay, owned and operated by two female celebrity chefs Mary Sue Milliken and Susan Feniger, has a new face heading up the kitchen, Executive Chef Richard Hoffmann, who most recently was the Executive Sous Chef for Mandalay Bay and Delano. 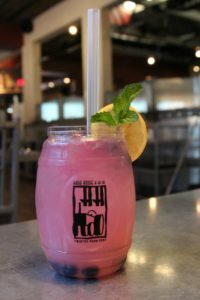 The four local Hash House A Go Go restaurants including at the LINQ and downtown Plaza have introduced the new Huckleberry Sin featuring 41 North Huckleberry Vodka mixed with homemade lemonade and fresh blueberries served in a souvenir Mason jar for $9.99 to their cocktail menu. Plus, Happy Hour from 3-6 p.m. has been extended to seven days a week. Ferraro’s Italian Restaurant & Wine Bar has introduced new fall selections to its Love Your Lunch menu, which includes a main course and soup of the day or house salad for $12.95. Gabriella’s Italian Grill & Pizzeria closed at Regal Colonnade retail center on Eastern Ave. by the 215, and now a new Italian restaurant has opened called Prosecco Fresh Italian Kitchen with a new décor. Presale tickets for downtown’s fifth annual Life is Beautiful Music & Art Festival just went on sale for next year’s dates Sept. 22-24, 2017. General admission for three days is $225. Cast members from “Rock of Ages” and performers from Cirque du Soleil will compete in a lip sync, three-round battle at Beer Park on the rooftop of Paris hosted by the cast of 53X at midnight on Thursday, Oct. 6. 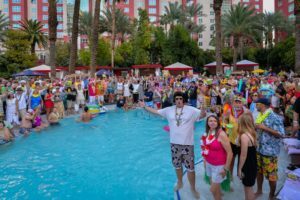 Margaritaville will again host its annual pre-concert pool party at the Flamingo GO Pool to coincide with Jimmy Buffett’s concert at the MGM Grand Garden Arena on Saturday, Oct. 15. The outdoor pool party from 11 a.m.-6 p.m. will have free admission and offer interactive games, food and drinks, live entertainment by The Boat Drunks and giveaways. 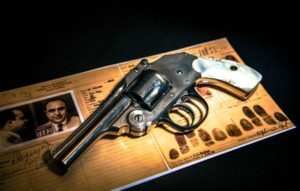 A Smith & Wesson .38-caliber revolver with a distinctive pearl grip once owned by mob boss Al Capone is on loan and on display at The Mob Museum downtown. The revolver was shipped from the factory in 1925 and sold by Wolf & Klar Co. of Fort Worth, Texas. It was confiscated in an arrest of Capone while he lived in Miami in 1928. After changing hands several times, the gun was finally seized and forfeited to the IRS in 2004. “America’s Got Talent Live” inside the PH Showroom at Planet Hollywood has added an additional show date on Sunday, Oct. 30 at 7:30 p.m. Shows will run Oct. 27-30 with the current winner Grace VanderWaal. The social reflexology spa Happy Feet has reopened at the El Cortez with foot-pampering treatments as well as chair, back and shoulder, and combo massages. Happy Feet opens daily at 11 a.m. In observance of National Pet Wellness and Adopt a Dog Month, Chapman Chrysler Jeep in Henderson will hold its third annual “Pamper Your Pet Day” event on Saturday, Oct. 15 from 10 a.m.-2 p.m. Four-legged attendees are encouraged to dress in Halloween best for the costume contest. California-based retail giant Curacao held its day-long grand opening for its first store in Nevada on Oct. 1 at the Meadows Mall. The new Las Vegas store is Curacao’s 12th in its growing portfolio.